Lake Merritt is a popular place for Oaklanders to exercise, picnic, and hang out. The sophisticated, upscale outdoor mall for North Berkeleyans (although it's located in West Berkeley). Think elegant home decor, housewares, clothing and shoe boutiques, makeup, skin products, toys, the Apple store, and Anthropologie. Plus, gourmet food, coffee, and more. One of Oakland's hippest 'hoods, clustered around Telegraph Avenue between MacArthur Boulevard and 51st Street. Offering bars, Korean restaurants, breakfast places, cafes, Ethiopian eateries, Burmese cuisine, fancy ice cream, art galleries, a farmers' market, and, of course, Bakesale Betty (home of the famous fried chicken/coleslaw sandwich), Temescal is a neighborhood that's seen an influx of young people in recent years. It's not at Mission District level (not enough density for that), so it still has a neighborhoody feel. But when people from across the bridge seek cheaper rent, this is where they're looking. Good luck. If Temescal is where twentysomething hipsters live and play, nearby Rockridge is where they go to have kids. Of course, you have to be fairly affluent to raise your kids in Rockridge, with its picturesque craftsman homes and leafy, tree-lined streets. College Avenue is the main drag, and it's got everything you could need: a Trader Joe's, boutiques, gourmet restaurants, antique shops, toy stores, wine bars, and cafes galore — plus the infamous (and perennially popular) Zachary's Chicago Pizza. Not to be confused with Piedmont, the small, affluent town surrounded by Oakland, Piedmont Avenue is a street in Oakland that's one of the city's main shopping destinations. There are a ton of great restaurants, boutiques, cafes, a well-curated movie theater, and a grocery store. Thanks to significant redevelopment money, the area (which is just north of Oakland's downtown) has seen the reopening of the historic Fox Theater (now a major concert venue) and an explosion of restaurants and bars. During the Art Murmur art walk, held every first Friday of the month, this place is packed. Now that a sizable chunk of what used to be considered Downtown is called Uptown, "Downtown Oakland" refers to the area around City Hall, at Broadway and 14th Street. Mostly the domain of city and federal workers (and thus home to a fair amount of lunch spots and bars), it's close to Chinatown, Lake Merritt, Jack London Square, and, of course, Uptown. Chinatown doesn't just exist in San Francisco. Less touristy and picturesque than its West Bay counterpart, Oakland's Chinatown, located east of Broadway between 6th and 12th streets, is a true ethnic neighborhood — full of restaurants, markets, and other businesses catering to the Chinese-American community. But don't let language barriers deter you from exploring: There are some true hidden gems to be found here. So-called because its namesake used to hang out in the area (most notably at the saloon Heinold's First and Last Chance, which still operates), the Jack London District is Oakland's waterfront neighborhood, which sits at the south end of Broadway. Though the location is ideal, the district has faced some stumbling blocks in its goal of becoming a tourist destination. Still, though, it's home to some excellent new restaurants and bars, Yoshi's jazz club, and a popular weekly farmers' market. One thing you'll learn about Oakland's neighborhoods: They're pretty small, sometimes only encompassing a few blocks. Old Oakland, which falls on the other side of Broadway from Chinatown, is one of those tiny neighborhoods, but it shouldn't be overlooked. The former heart of the city, Old Oakland is known for its distinctive Victorian architecture, which today houses superb restaurants, bars, and cute pop-up boutiques. For a taste of the old world, stop in Ratto's Market and Deli, an Italian deli that's been around for more than one hundred years. 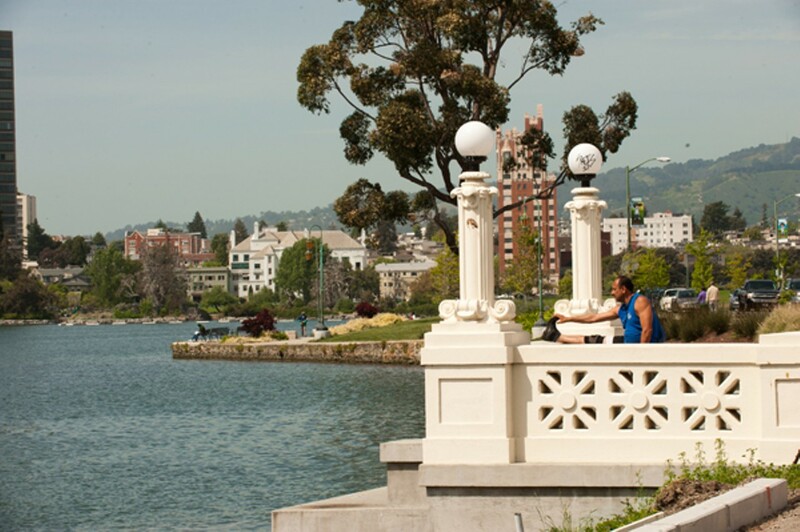 Lake Merritt is known as Oakland's "crown jewel." The park area surrounding this large tidal lagoon is a popular place for Oaklanders to exercise, picnic, and hang out, and even spy a turtle or two. It's also home to Children's Fairyland (Disneyland's precursor), the famed Grand Lake Theater (which features a live Wurlitzer organ concert before Friday- and Saturday-night screenings), a huge weekly farmers' market, shopping, and a lot more. Oakland's equivalent of the Mission District (minus most of the gentrification), East Oakland's Fruitvale neighborhood is home to the city's sizable Latino population, but there's a strong Asian presence here, too. The loncheras (taco trucks) are ubiquitous, hella cheap, and serve up some up some of the most authentic food around. There are also great produce markets, huge thrift stores, hole-in-the-wall restaurants, and a lot more. Just across the estuary from Fruitvale, Alameda is the island that time forgot. Immaculate Victorian houses, wide streets, a citywide 25-mile-per-hour speed limit, a huge beachfront, a quaint downtown, and a giant former naval base: It's a town that seems like it should be somewhere else, yet it's so close. Besides the old-school businesses (Ole's Waffle Shop, barbershops, the Pacific Pinball Museum) and vibe, Alameda also has a 21st-century multiplex and outdoor mall. If you love all things vintage, don't miss the monthly Alameda Point Antiques Faire. Yes, West Oakland is known for high rates of crime, poverty, and asthma (thanks to its proximity to the Port of Oakland), but it's also a neighborhood with a large population of artists, musicians, craftspeople, urban farmers, and other creative, entrepreneurial types who take advantage of the neighborhood's low rent and abundance of warehouses. It's also got a rich history and was once a thriving African-American neighborhood, as it was home to railroad workers and ship builders, and an abundance of lively jazz and blues clubs. Known (for better or worse) as the "Gourmet Ghetto," North Berkeley is best known for its epicurean pleasures: Chez Panisse, the original Peet's Coffee & Tea, The Cheese Board, Saul's Restaurant & Delicatessen, et al. It's a bucolic neighborhood, with gorgeous homes tucked up in the hills, secret stairways connecting streets, the Berkeley Rose Garden, Tilden Park, and enough trees to make you feel like you're not living in an area with 7 million other people. One of the most desirable places to live in Berkeley, Elmwood is close to everything: campus, Rockridge, the hills, every freeway — not to mention shopping (hello, Jeremys! ), cafes, and restaurants. Nestled in the shadow of the grand Claremont Hotel & Spa, the neighborhood is a mix of families, students, professors, and professional types. It's a great place to get a cappuccino and study, then pick up a pair of jeans afterward. Encompassing the area south of campus, South Berkeley — the main thoroughfares of which are Shattuck Avenue and University Avenue — is where Berkeleyans work, play, and do business. Indian restaurants? Check. Bookstores? Yep. Movie theaters? Uh-huh. Fancy restaurants? Berkeley Repertory Theatre? The Jazzschool? Freight & Salvage? All this — and more. A small city located between Berkeley and Oakland right next to the bay, Emeryville has been hugely successful in attracting businesses. Though once home to bordellos and gambling parlors, today it's the site of tech and biotech companies including Pixar Animation Studios, Bayer, Novartis, and LeapFrog, as well as IKEA, Guitar Center, and the Bay Street mall. Not exactly pedestrian-friendly, the city is nonetheless easier to get to (by car) than San Francisco or Walnut Creek if you're looking for the big-box experience. Off the main drag, there are also great restaurants (Townhouse Bar & Grill), bars (Honor Bar), and other notable businesses.